Gather items like water, weather radio with extra batteries, snacks, blankets, and flashlights. Limit travel during a tornado watch. One of the most dangerous places you can be during a tornado is in your car. Keep alert and watch for changing weather conditions. Watches give you time to plan and prepare by placing small objects inside (such as garbage cans, bicycles, and patio/deck furniture). Keep children under close supervision. Make sure you have a portable radio, preferably NOAA Weather Radio, for weather alerts and updates. Seek shelter in the lowest level of your home, such as a basement or storm cellar. If you don’t have a basement, go to an inner hallway, a smaller inner room, or a closet. If you’re in a building such as a church, hospital, school, or office building, go to the innermost part of the building on the lowest floor. Do not use elevators because the power may fail, leaving you trapped. You can cushion yourself with a mattress, but don’t cover yourself with one. Cover your head and eyes with a blanket or jacket to protect against flying debris and broken glass. Don’t waste time moving mattresses around. Stay inside until you’re certain the storm has passed, as multiple tornadoes can emerge from the same storm. Do not leave a building to attempt to “escape” a tornado. Avoid buildings with long-span roof areas such as a school gymnasium, arena, or shopping mall, as these structures are usually supported only by outside walls. When hit by a tornado, buildings like these can collapse because they cannot withstand the pressure of the storm. A long-standing safety rule has been to get out of the car and into a ditch. If you do that, you should get far enough away from the car so that it doesn’t tumble onto you. Being below the prevailing ground level may shield you from some of the tornado wind and flying debris, but there is still danger from those. DO NOT get out of a vehicle and climb up under the embankment of a bridge or overpass. This often in-creases your risk. Do not remain in a mobile home during a tornado. Even mobile homes equipped with tie-down systems cannot withstand the force of a tornado’s winds. 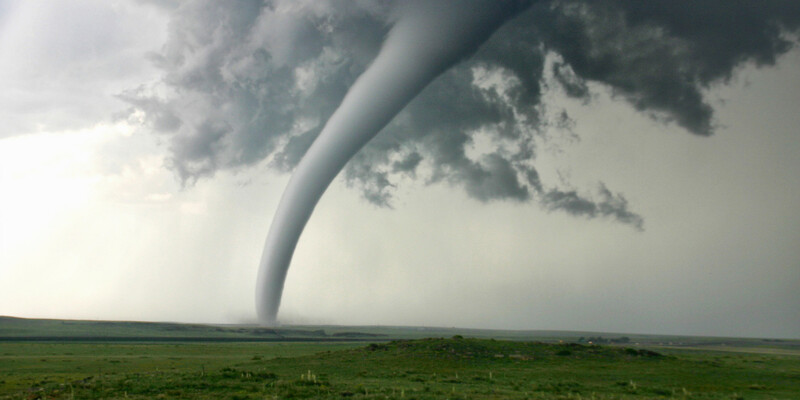 Heed all local watches and warnings and leave your mobile home to seek shelter as quickly as possible before a tornado strikes, preferably in a nearby building with a basement.